This range of flies has been designed by some of Australia's top Guides, and have been tied by Fulling Mill. All have been tied with premium materials, and on the best hooks. Comments and insights on each fly are from each flies designer. 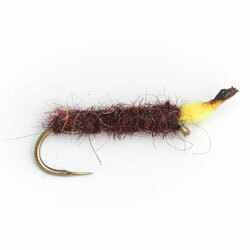 The loop wing claret hopper can be fished singly or in a team. It can genuinely fit anywhere in a cast of three flies and works in sunny or overcast weather. This differs from the normal claret hopper in that it has a possum wing which is highly suggestive of a mayfly, emerging from the nymph. The possum fur also adds floatability to what is otherwise a poor floating fly. Again, this fly can be pulled across the surface and fits beautifully with other dries that have the same attribute. I have had tremendous fishing with this on Little Pine when other flies failed. It is very effective during mayfly hatches but I have had as much success using it without a mayfly in sight and on waters with very few mayfly. 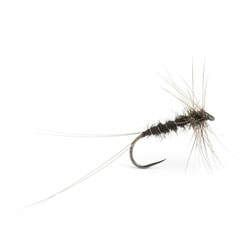 On those tricky days when fish are rising once and then disappearing, this fly will pull them up. I carry dozens of these at all times. Barbless. The best nondescript fly in my fly box. Will take fish blind and takes them on duns, chironomids, beetles etc. If I could only fish one fly – this would be it. Use a floating fly line. It is always dangerous when you mess with a great fly pattern such as the red tag! The palmered orange tag has as many differences as there are similarities. This pattern floats much better than the original red tag due to the palmer but remains very delicate. The palmer gives the fly obvious advantages but most importantly, it enables you to fish a very small fly in a fast current and still be able to see it, knowing that it is floating well. 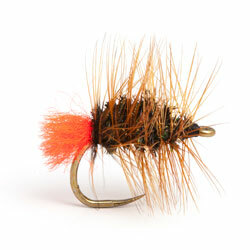 If you want to fish a small fly but have difficult seeing them, this is the fly for you. The orange tag replaces the normal red, giving the fly even more subtlety. The tying of this fly ensures that no matter how it lands, it look the same to the fish. I.e. unlike other flies, it doesn't matter how it sits on the water. This is a polaroiding fly, and one that is best fished by itself. It is equally at home on lakes and rivers and is a fantastic searching fly, able to be fished blind and especially to difficult fish. Although you could do it, I don't recommend this fly as one to fish a nymph under. There is no particular lake or river in which this fly works best. It should be carried in various sizes and cast at any opportunistic fish. If anything, go smaller! Barbless. There are many orange spinner patterns available and this one is a variant shown to me former Tasmanian fishing guide, Damian How. Originally it was used on the lowland rivers of northern Tasmania where the fish would eat it in preference to many other imitations. Now, it is regularly tied on not only when fishing the rivers, but in all other lakes which contain orange spinners. These include Woods and Arthurs Lake, Lake Leak, Four Springs, Penstock, Bronte and many more. The fly is designed to be fished when trout are eating spinners and as such, it is fished singly to sighted fish. The fly is designed to land the correct way every cast and closely represent the natural insect. Fished in quiet backwaters on rivers or to jumping fish, this is the most effective orange spinner pattern I have ever used. These flies are under used by almost every Tasmanian angler and although the window of opportunity to use them may be small in comparison to many other flies in the range, when the fish are locked in on this colour of spinner, you must have it on the end of your long leader. Barbless. The Black Spinner must surely be the most popular dry fly for polaroiding on Tasmanian lakes. If not, it should be. The fly is fine and as the name suggests, black – two things that help the fly to get eaten in tough, bright conditions. Along with the “Spun”, I am not sure that I need another fly when polaroiding in Tasmania. This Black Spinner is designed to sit correctly every time it lands and is deliberately tied ‘sparse’ to remove unnecessary material. This gives the fly a much finer, more lifelike profile and less reason for the fish to refuse it. It also means that the fly does not float as well as many dry flies as it does not have the capacity to hold floatant very well. It is specifically designed to float long enough to remain on the surface for enough time for the fish to cruise over and eat it. It is not designed for rough weather or blind fishing. The fly must be fished by itself on a long leader and not in a team. Aim at the fish and cast with a delicate presentation. 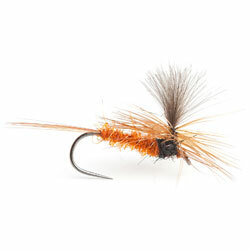 As is the case with the Orange Spinner, the Black Spinner should be used on any waterway that contains mayflies. There are far too many to mention. One of the beauties of this fly is that you do not have to see the natural black spinners in order to tie it on. All you have to do is see the fish and during the summer and autumn months, it is rarely refused. You can’t have too many of these in your box. Barbless. I don't think that this fly needs an introduction to people who fish in Tasmania and any mayfly water on the mainland. It is quite simply the single dry fly that you cannot be without. 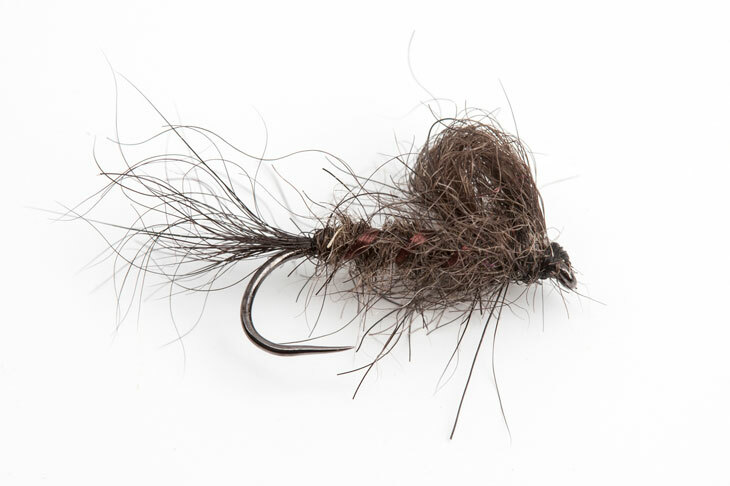 Unlike the standard black spinner, this fly is much easier to see and floats for longer. It sits the right way every cast and gives you confidence when you see it on the water. It is no wonder really because the fish eat it with such confidence. 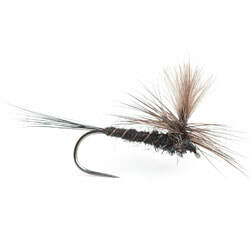 It is an exceptional polaroiding fly but it is equally as good as a searching pattern close to banks and around weed or down bubble lines in rivers. The rivers of Tasmania and the mainland are made for this fly. It is a large fly and that's how the trout like them. When you see mayflies on the water, this is a go to pattern and when the fish are jumping to eat them, it is even better. Barbless. 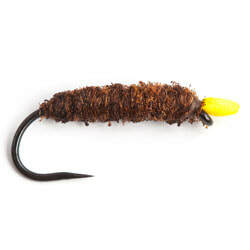 I am not sure why this fly is not more popular amongst anglers. The black coloured version is a staple amongst all Australian anglers while the orange version doesn't get the credit it deserves. On many occasions both in Tasmania and on the mainland, I have had fish ignore the black spinner and eat the orange one. From early in the season right through to the end, this fly is eaten well. Once again, the presence of mayflies is helpful although not a prerequisite. I love the larger sizes of these as they float well and people with poor eye sight seem to be able to follow the drift of the fly much better but on the rivers, the smaller version is always eaten with gusto. Mainland River’s such as the upper Mitta Mitta and Murrumbidgee are full of fish that love this fly while in Tasmania, all of our mayfly waters (both river and lake) are ideal locations to fish this fly. As I previously mentioned, if the black one isn't working, change to the orange before going away from the spinner patterns. Barbless. The “Spun” is as the name suggests, a half spinner, half dun. It was invented by my good friend and Tasmanian based fly fisherman, Cameron Spur. 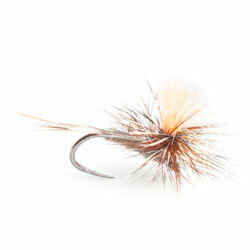 Cameron tied this fly in the early nineties for polaroiding and fishing to fish that are inherently difficult to catch. He was successful. While filming “Tasmanian Fly Fishing Techniques Vol 1 and 2”, this fly proved itself time and again. It is in the same mould as a black spinner but is much easier to see and floats better. 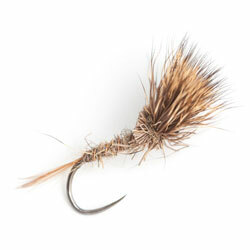 The Spun is also suggestive of a spinner, a dun and an emerger. It covers so many bases. I do not fish this fly in a team as it is best fished singly to sighted or rising fish. Whether on lakes or rivers, this is a superb fly. I often snip the bottom half of the hackle off, flush with the end of the hook eye. This ensures that the fly will sit correctly 100% of the time and can also be used as a ‘spent’ pattern. No fish in the western lakes is safe when using this fly. I never seem to have enough of these flies in my box and consequently, I save them for when we are fishing at large fish in clear water. This pattern is only ever used singly and never in a team. I put it on the end of a fine tippet (.12 - .14mm) and cast it at sighted fish. Never move this fly! Thank you Cameron!!! Barbless. 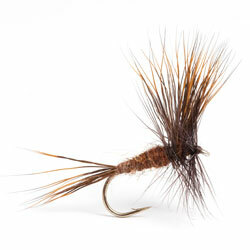 The Parachute Adams is one of the world’s highest selling and most used dry fly. It is a pattern that originates in the USA and for most of my guiding life; it was not in my armoury. Mainland angler, Phil Weigall changed that along with many of my clients. I am a big believer in confidence and being confident in your fly when you are using it. I found that many of my clients would ask me what flies we might be using during the day on a river and were always surprised when a Parachute Adams was not mentioned. Some anglers would not fish with much confidence until I tied one on and then their entire demeanour would change. It is such a successful fly on the mainland of Australia that it is arguably the most used dry fly there and by Australian anglers travelling to New Zealand. The reason it is so popular is because it catches fish and lots of them. I still had the problem of clients not being able to see the fly well in poor or mottled light which lead to the addition of a fluoro post. This was met with much appreciation from clients and knowing that the change of colour from white to orange makes no difference to the fish yet orange is easier to see, this is now my staple Parachute Adams tie whenever I use it, anywhere in the world. Barbless. My great friend, Damian How, showed me this fly two decades ago. At the time, Damian was guiding in North Western Tasmania and was catching more fish than anyone else. He and I had a day on the St Patricks going "fish for fish" with an F Fly and a Grab All. At the end of the day and at the end of many such days, it was very hard to split the two flies and when considering the F Fly is arguably the world’s greatest adult caddis imitation, the Grab All has to be held in similar regard on our rivers. What makes it even better than many flies I see being used on the river, is how easy it is to see. From a guiding point of view, it is perfect. You basically have a small fly that is very easy to see in all light and water conditions that the fish eat very well. It has become a standard fly when fishing rivers and lakes in New Zealand and occupies two rows in my fly box. Thank you Damian! Barbless. The shaving brush is a favourite of many anglers across Australia. It represents an emerging mayfly, is easy to see, holds up nymphs in larger sizes and is at home as a point fly as well as any other slot on your leader. This fly is a wonderful polaroiding fly when fish are eating emergers. It sits beautifully in the water with the post sticking up and is a rare breed of fly that is easy to see yet quite subtle in its appearance. Make sure that you have different sized Shaving Brushes as the only reason a selective trout may not eat it, is because the size is wrong. In some light conditions and on certain days, trout will prefer the lighter or darker version of this fly. It may even be mayfly species dependent, but having a leader set up with one of each colour is a good way to search for your first trout of the day. Early in the season, the fish seem quite keen on the lighter version and as the season progresses, their preference often switches but this is very much a generalisation. The shallow, silty bottom of Tasmania's western lakes abound with light coloured nymphs and the Hares Ear version is my favourite here while the weedy water of Four Springs and such lakes across Australia, lend themselves to the claret version. On many occasions, it is hard to choose between them and that's why I carry and use both. The Shaving Brush is equally at home on rivers and lakes and indeed some of my good friends use it as their number one fly when fishing the rivers of New Zealand. Make sure that you don't put floatant on the body of the fly, only the wing. Barbless. 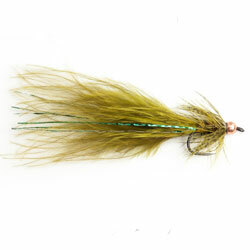 This is a simple adaptation of one of the greatest mayfly patterns I have ever used, the Possum Emerger. Basically, it is a Possum Emerger but this one is claret. I first tied this fly in the mid 1990's but I had a deer hair wing on it. With the success of the original possum Emerger and the claret "deer wing" Emerger, it seemed obvious that a combination of the two would work well. Possum is much easier to work worth and floats better than deer hair which made this fly a no brainer. Anywhere that mayfly are present, this fly will work as a point or middle fly in a three fly rig. It is also very effective when polaroiding and floats well after you catch a fish. It only needs to be dressed with floatant once, at the start of the day and will keep floating all day long. There are not enough superlatives to describe this fly. Barbless. Any Australian fly fisherman should already know about the effectiveness of this fly. My guiding diary over the past twenty years clearly shows that this fly has caught many, many more fish than any other fly I have. It is clearly my number one fish catcher and many of my clients have caught their first ever trout on this fly. It was shown to me by the former owner of Rainbow Lodge, Neil Grose and I believe that it was invented by well-known Australian fly tier, Muz Wilson. Its genius lies in its simplicity and effectiveness. 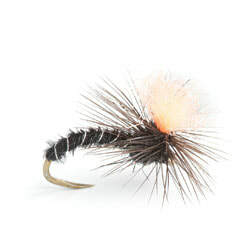 I have seen a hundred different versions of this fly and they are no doubt all effective but it is one of those flies that should be kept simple. 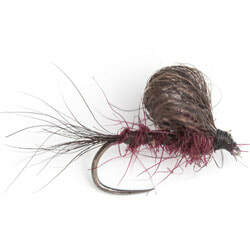 Possum fur floats extremely well when treated with floatant and this fly is 100% possum. It can be pulled hard on top of waves, fished static to cruising fish, be used singly or in a team and it will be equally effective. I have seen more than twenty fish caught and released on the exact same fly and still have it float perfectly. It is remarkable. It is important to remember that at times, the fly will be very hard to see. It is best fished on the point in a team and will therefore be a long way past the end of your fly line. Being small and dark, it does not stand out well. This is a positive attribute. It is subtle and as such, it is eaten with confidence. You DO NOT HAVE TO SEE THIS FLY when fishing it. Simply look around the area in which you think the fly will be and when you see a confident rise, STRIKE…. it will be your fly! If the fly does sink at any stage, just fish it back to you slowly and be prepared for a classic nymph take. Any lake that has mayflies on it will be perfect for this fly. I have not used it on rivers but perhaps I should. Once a lake has seen mayflies hatching on it during the season, this fly can be fished blind even when nothing is rising or hatching. Foam lines and slicks are other places where this fly catches a lot of fish. Remember that when all else fails, try moving it across the surface. The carrot fly was introduced to Australia by famous English fisherman, John Horsey. The original pattern was orange in colour but all other colour variations were used. As claret is a particularly good colour in Australia when our mayflies are hatching, the claret carrot was always going to be successful. Originally designed as a ‘sighter’ fly when using a three fly rig, the claret carrot is very much a fish catcher on its own. This is a top dropper fly. The floatability of the fly makes it perfect for ‘pulling’ along the surface but it is eaten static just as often. Large sizes are the norm as the bulk adds to its effectiveness. When mayflies abound, this fly is at its best and even more so when there is a good wave. For one of my guides, this is the number one fly for ‘shark fishing’ on Great Lake because it is so easy to see and readily eaten. 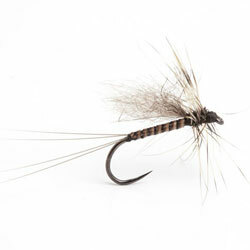 Although you can use this fly in a ‘nymph under dry’ rig, it is better used in a team and when you are trying to pull fish to the surface when there appears to be nothing happening. Barbless. Good, high floating dun pattern, especially in rough weather. Good Penstock fly fished off the floating line. In size10 it is good for suspending the Krystal Flash Nymph with 3 foot dropper. Use a floating fly line. My go to fly when the Jassids are about, gathers dust in the fly box waiting for the next Jassid fall but I would feel naked without half a dozen when it happens. Use a floating fly line. This caddis pattern is most effective in water deeper than one meter. It sinks faster than the Polaroiding Caddis and is a great edition to a team of nymphs when fishing from a boat. Bank anglers will find this a terrific fish catcher when using the dry / dropper technique as it gets "to depth" at a naturally fast rate. The fly itself is very imitative and works well on spooky fish. 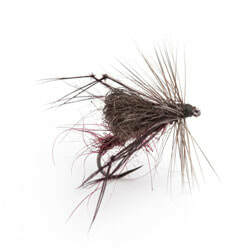 A fly pattern for both mainland and Tasmanian waters, this is one of those flies you should always have with you. Barbless. 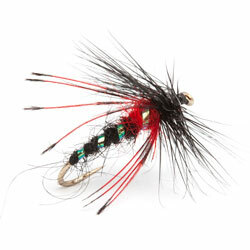 This fly was designed for sight fishing whether it be polaroiding or tailing fish. Almost every trout in Tasmania has a stick caddis in its stomach at all times. This fly sinks slowly which enables you to present the fly well ahead of a moving fish without spooking it. It was originally designed to be fished by itself on a leader of around twelve to fifteen feet. That is not to say it can’t be fished in a team of flies on the top dropper or in the middle. This fly works in every lake! Barbless. For the last few seasons this fly has taken the most fish of any pattern used. Normally fished 3ft under a big indicator fly like the Brown Wulff with a fluorocarbon dropper. This fly appears to imitate the sub surface mayfly nymph during its emerging phase and is as effective during a hatch as before. Fished best with a floating fly line. If fishing by itself try a very slow figure 8 retrieve, just keeping in contact with fly.